Obstructive sleep apnea (OSA) is a common, deadly sleep disorder which affects approximately 17% of all adults. While many factors may decrease one’s airway which can lead to OSA, one of the main contributors is obesity. In fact, OSA is seen in approximately 40–70% of overweight people. OSA leads to increased daytime sleepiness which can be the cause of workplace injuries, falling asleep while driving, and even depression. OSA has also been shown to cause strokes, heart attacks, an irregular heartbeat (AFib), and uncontrolled high blood pressure. New evidence has shown that OSA is also a cause of other diseases such as diabetes and even cancer. In fact, OSA leads to a 4-fold increase in patient death. Obstructive sleep apnea is caused by collapse of your airway (Figure 1) while you are asleep, which leads to oxygen not being able to be delivered to your brain. This decrease in oxygen causes a person to be aroused just long enough to breathe. However, it is these frequent, repeated pauses in your breathing which prevent you from obtaining restful sleep. Some of the most common symptoms of OSA include snoring, waking up abruptly or gasping for air while asleep, excessive daytime sleepiness, poor concentration and even morning headaches. One of the best ways to understand how the loss of sleep affects people is by looking at daylight savings time. The day after we lose an hour in the spring, hospitals around the country see a 24% increase in heart attacks compared to what would be seen on a normal day. In the fall, when we gain an hour, hospitals report a 21% decrease in heart attacks. This is all due to what researchers feel is 40 minutes of sleep that is either gained or lost. In addition, researchers have discovered that it actually takes our bodies weeks to make up this 40 minutes of lost sleep. There are both surgical and medical treatments for obstructive sleep apnea. The most common surgical treatments include functional rhinoplasty or uvulopalatopharyngoplasty (UPPP). These procedures are designed to remove the obstruction in a person’s nose or throat, respectively. While these procedures might significantly help some people, they definitely do not help everyone. For those who are either not a surgical candidate or that the procedure did not give them enough improvement, there is CPAP (continuous positive airway pressure). This is where a person is attached to a machine which continuously blows air into their lungs by a mask that they wear. It is the pressurized air being blown through the mask that opens up the individual’s airway. Even though this technique is effective, approximately 50% of the patients stop using their CPAP machine at one year either due to their dissatisfaction or that of their spouse. 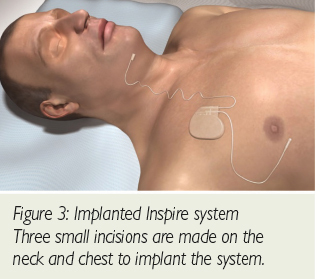 The traditional choices we have to treat obstructive sleep apnea were expanded in 2014 when the FDA approved Inspire. It works inside your body with your natural breathing process, without the need for a mask or tying you down to a machine. While you are sleeping, Inspire monitors every breath you take. Based on your unique breathing patterns, the system delivers mild stimulation to the hypoglossal nerve, which controls the movement of your tongue and other key airway muscles. By stimulating these muscles, the airway remains open during sleep (Figure 2). The system is placed under the skin during an outpatient surgical procedure (Figure 3). Patients can return to their regular diet and most activities of daily living immediately after the procedure. Another benefit of this technology is that you are in control of your therapy by a remote you use to turn the system on when you are ready to go to sleep. There is no other equipment that you need, and it is also compatible with all imaging techniques, even MRIs. Recent studies have followed patients for up to 4 years after their Inspire procedure. These studies have shown a 79% reduction in sleep apnea events, 88% reduction in snoring, 90% reduction in bed partners feeling the need to leave the bedroom, and a significant increase in patient daytime activity levels with a significant reduction in daytime sleepiness. Even with these results, the most important question is what does the patient think? In the most recent long-term study, 93% of patients were very satisfied with Inspire. This is one of the main reasons why in 2018, Inspire was ranked #2 in Cleveland Clinic’s annual list of Top 10 Medical Innovations. 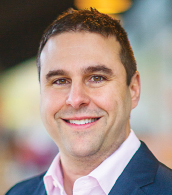 Dr. DeFatta sees patients in Altoona, Baldwin, Durand, Black River Falls, Hayward.